"I wish I could give you a precise answer. Perhaps the best way to describe it is a sort of formless, shapeless thing floating about in space like a cloud of mist, only... with a mind and will." 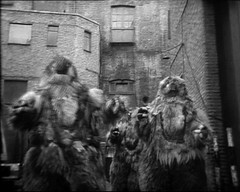 Captain Knight's party are stopped from reaching Holborn by the fungus as is the Doctor's attempt to get to the Tardis. The Doctor takes a sample of the Fungus in Evans' tobacco tin. 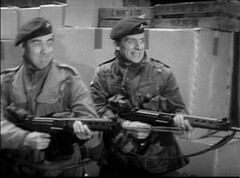 Returning to HQ they find the soldiers, including Weams, dead and Professor Travers missing. The Ops room map shows more stations have fallen to the fungus with just a few left. Lethbridge-Stewart speculates on who the traitor is, thinking it may be the abducted Professor Travers while the Doctor feels the absent Chorley is a much more likely candidate. The Doctor tells them about the Tardis and the Colonel decides to mount a rescue mission. 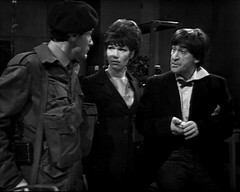 The Doctor and Anne work on a device to override the Intelligence's signals and control a Yeti. 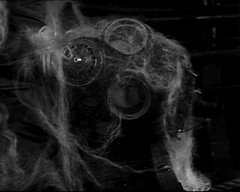 Evans finds one of the missing Yeti models which the Doctor deactivates. Arnold, Lane & Evans are to take a trolley to Covent Garden while he takes the majority of the soldiers overground to the station. 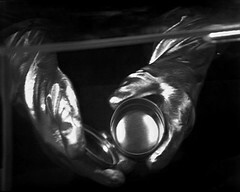 Examining Evans' tobacco tin The Doctor finds it empty, casting suspicion on the Welsh driver. Arnold & Lane don respiratory gear and venture into the fungus with the trolley. Hearing screams Evans drags the trolley back finding Lane's dead body on it. 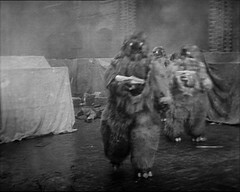 Lethbridge-Stewart's party are ambushed by Yeti. Captain Knight accompanies the Doctor to the surface to fetch electronic spares. While they are raiding a shop a Yeti enters, killing Knight before leaving. Searching Knight's body the Doctor finds one of the other two missing Yeti statues. He returns to Goodge Street just before Lethbridge-Stewart, the sole survivor of the surface expedition to Covent Garden. 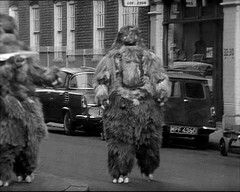 Searching the Colonel's pockets they find the final Yeti statue as two Yeti enter with an Intelligence possessed Professor Travers. Weams dies in the Yeti attack on HQ. Lane is killed trying to move the trolley through the Web. 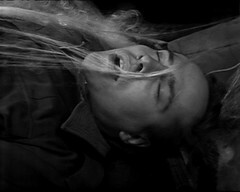 Arnold disappears in the same incident but at the moment his fate is uncertain. 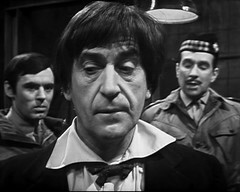 Blake is the final casualty in the battle at Covent Garden which only Lethbridge-Stewart survives. Knight is killed by the Yeti at the electronics shop. Knight and Blake's deaths are just brutal, clubbed down by the Yeti. But both happen in front of us. Knight dies protecting the Doctor, on a trip to the surface that Knight wasn't particularly in favour of, but there's just something about Blake's demise that seems wrong. 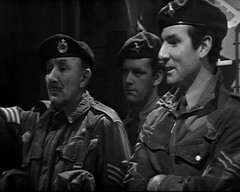 Apart from Lethbridge-Stewart, he's the last survivor of the party travelling to Covent Garden and he's seemed such a likeable character, a tribute to Richardson Morgan's acting skills which made him stand out in the first few episodes of the story. COLONEL: Doctor. Been thinking about what you were saying earlier. About someone here in HQ being responsible for all this. Could it have been Travers? KNIGHT: Well, after all he has disappeared. DOCTOR: Yes. So has Chorley. I'd say he was a much more likely suspect. DOCTOR: On the other hand, of course, whoever is in league with the Intelligence could still be amongst us here. COLONEL: That's a fact of which I am uncomfortably aware. But tell me, Doctor, this Intelligence, exactly what is it? DOCTOR: Well, I wish I could give you a precise answer. Perhaps the best way to describe it is a sort of formless, shapeless thing floating about in space like a cloud of mist, only with a mind and will. COLONEL: What's it after? What's it want? DOCTOR: I wish I knew. The only thing I know for sure is that it brought me here. COLONEL: Yes, been wondering how you got here. DOCTOR: Yes, well, I don't think there's any harm in telling you now. I have a craft that travels in time and space. COLONEL: This craft of yours, this time space craft. Could it get us out of here? DOCTOR: Well, yes, but it's at Covent Garden. COLONEL: What does it look like? DOCTOR: It's a police box. COLONEL: So if we could rescue that craft, you could take us out? DOCTOR: Yes, yes, I could, but I have to stay here and finish Travers' work. JAMIE: Ah, Doctor. Miss Travers is feeling all right now and would like to see you right away. DOCTOR: Very good, Jamie. Excuse me, gentlemen, please. COLONEL: So you don't believe him? KNIGHT: No, of course not, sir. The whole idea is screwy. A police box? COLONEL: Well whether you think it foolish or not, we are going to rescue that craft. COLONEL: Captain Knight, the Army has failed to defeat this menace. Now the Doctor thinks he might succeed. Personally, I doubt it. But if we stay here, we're as good as dead. Therefore I do not intend leaving any escape route unexplored, however screwy you may think it. COLONEL: Let's get on with it, shall we, Knight? KNIGHT: Sir. I suppose you've considered that the Doctor might be leading us into a trap? 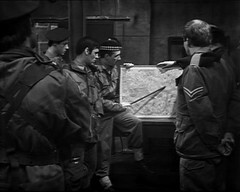 COLONEL: So my party will get above ground and approach Covent Garden by Neal Street. Is that clear? COLONEL: Now Staff here will be taking the trolley through the tunnel, and will arrive, we hope, at the same time as we do. You picked your two men, Staff? ARNOLD: Yes, sir. Lane and Evans. COLONEL: Right. Now as soon as we get there, we shall be looking for a police box. BLAKE: A police box, sir? COLONEL: Yes, a police box. Now I want that box either out of the station or onto the trolley as quickly as possible. Is that understood? BLAKE: Yes, sir, this police box. Is it important? COLONEL: Corporal Blake, we'd hardly be going to this trouble if it weren't. KNIGHT: Who's going to look after the civilians, sir? COLONEL: I'd like you to stay behind and look after them, Captain Knight. The Doctor's got work to do. Right, gentlemen, time to go. Despite this attempt to rescue the Tardis, Lethbridge-Stewart doesn't even see the outside of the Tardis here, that'd have to wait till the Third Doctor's/Jon Pertwee's début story in 1970. As for the inside of the Tardis, he doesn't see that for another 5 years after this! He first goes inside in the Three Doctors and interestingly it's Patrick Troughton's Second Doctor in it then! When I first watched this episode for the blog I said that the fight scenes sounded good and looked great from the telesnaps (it was the first time I'd seen them) and that there was even a few moments of the battle preserved thanks to the Australian censors which gave us our first surviving glimpse of Lethbridge-Stewart. Now of course we can watch the entire thing. I'll freely admit that, tipped off by a comment made online, one of the first things I watched when the downloads became available was the battle from this episode (appropriately enough on my iPad while in the bathroom) and it's fab, a superb action sequence. The rest of the episode is superb too especially the sequence with Arnold, Lane and Evans pushing the trolley into the web: Arnold and Lane go in but following screams only Lane's body is pulled out with Arnold missing presumed dead. This scene is one of two sequences in the episode where Camfield's filmed back through the web to show the action occurring outside it and the effect looks superb. It's worth noting that the cowardly Evans doesn't even try to do a bunk following this he just heads straight back to HQ. JAMIE: Hey, come back, Doctor. DOCTOR: It's all right, Jamie. I'm not going to do anything silly. I just want to try and get a little bit for analysis. VICTORIA: Oh Jamie, stop him. DOCTOR: It's all right, Victoria. Has anyone got a box? EVANS: I've got my tobacco tin. EVANS: But then it's got tobacco in it. EVANS: Hey! Oh, all right. I only hope you think the sacrifice is worth it. DOCTOR: Hold the tin for me, would you, Evans? EVANS: Well, don't look at me. I didn't want to come down here in the first place. I shouldn't be down here at all, really. Driver, I am, see. Well you'd better have this before you say I've nicked it. EVANS: And I'll have that tin back when you've finished with it. DOCTOR: Don't look so unhappy. We're all under suspicion, you know, including me. ANNE: What's in the tin, Doctor? DOCTOR: It's the fungus from the tunnel. I thought if we examined it, it might give us a clue. DOCTOR: Now you'd better stand back, Anne. ANNE: Is it really necessary, Doctor? DOCTOR: This fungus is an unknown quantity, you know. DOCTOR: Oh, Jamie, what is it? JAMIE: The Colonel says to tell you he's on his way. DOCTOR: On his way where? JAMIE: To rescue the Tardis. DOCTOR: He's wasting his time. DOCTOR: Shush. Now look. Get behind me, both of you, and keep clear. Here we go. ANNE: What is it, Doctor? DOCTOR: The tin's empty! Evans! The disappearing Fungus is obviously meant to cast suspicion on Evans. But assume for a moment he isn't the traitor then what did happen to the Fungus in his Tobacco Tin? Did it just evaporate? If Evans didn't tamper with it or pass it to anyone else it's the only solution that makes sense! 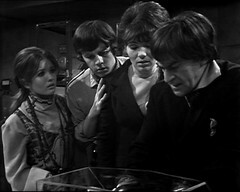 This episode is really, really fabulous well worth a watch and one of the best examples of sixties Doctor Who I've seen. We might be be upset about episode 3, the first proper appearance of Lethbridge-Stewart being missing but I think it would have been so much worse if this episode had been the one missing from the set in Nigeria. 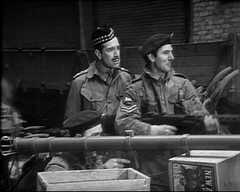 If Douglas Camfield makes one mistake in this episode it's his use of Martin Slavin's Space Adventure over the Covent Garden battle scene. Not that it isn't suitable or doesn't fir the action, it works fine on those points. It's just that to my mind, and many other Doctor Who fans too, this piece of music is too strongly associated with the Cybermen having been used in The Tenth Planet, Moonbase and Tomb of the Cybermen. If you're a Doctor Who fan you'll immediately recognise the top name on that list: John Levene, the future UNIT Sergeant Benton. He'd already had an uncredited role in The Moonbase episode 3 in early 1967 as a Cyberman. He then spent most of the rest of the year appearing as an extra in Z-Cars notching up 13 episodes between March and September. Four of these were directed by Douglas Camfield, who re-employs him here and would later use him on an episode of Detective, and another was by future Who producer Barry Letts, who was in charge of Doctor Who when Levene became a regular. He features on the Fantom Films Who Talk Commentary CD for this story appearing on episode 6. 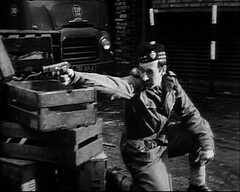 The Web of Fear is Gordon Stothard's first acting job. He returns as a Cyberman in four episodes of the Wheel in Space and then, uncredited, as a Prison Officer in Mind of Evil. After that he changes his stage name to Gordon St Clair and appears under this name as Grun, the King's Champion, in all four episodes of the Curse of Peladon. 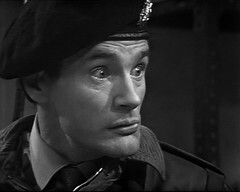 John Lord also returns as Masters, one of Reegan's henchmen in episode 4 of The Ambassadors of Death. Philip Ryan (on the right)returns to Doctor Who in the Mind Robber 2 & 3 as a Redcoat and Inferno 5 & 6 (director D Camfield). Tim Condren (center) had been in Time Meddler 4: Checkmate as a Saxon Warrior (I wonder who directed that ;-) ? ) 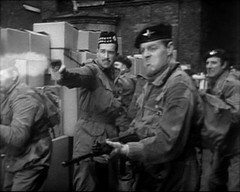 and would return in Day of the Daleks 1 as a Guerilla. His lengthy career involves a lot of extra and stunt work. But the three most recognisable names here are Derek Ware (IMDB), Terry Walsh (IMDB) and Derek Martin (IMDB. 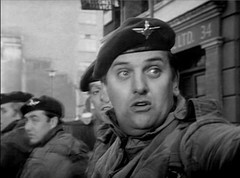 In this photo Martin's on the right looking at the camera, Walsh is semi obscured behind him and to the left and to the left of him, looking left, is Ware. (My Thanks to David Brunt for correcting my identification of who's who in the photos) He's been a Doctor Who supporting artist for many years appearing as an Extra in The Romans 4: Inferno and a Parisian in Rue des Fosses St. Germain in The Massacre. After playing a soldier here he fulfills the same role in Spearhead from Space, Inferno & Claws of Axos, a Thug in The Ambassadors of Death, a Prisoner in The Mind of Evil and David Mitchell in Image of the Fendahl. 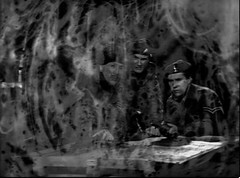 He was in Out of the Unknown as a Guard in The Counterfeit Man which you can see in the Out of the Unknown DVD Set. He's also in The Sweeney as Spooner in Messenger of the Gods and The Professionals as Renshaw in Not a Very Civil Civil Servant. He's now best known for playing Charlie Slater in Eastenders. He pops up on the Who Talk commentary CDs talking about Web of Fear 4 and fetures in the Inferno Special Edition DVD Havoc documentery. Derek Ware had worked on the program since the very beginning serving as the fight arranger on the very first story, which Camfield worked on as a Production Assistant. He returns for the Aztecs and then the Crusade (Camfield's full directorial début), cameos as a Bus Driver in The Chase 6: Planet of Decision (in a sequence directed by Camfield). He serves as a Trojan Solider & Fight Arranger for the Myth Makers before being reunited with Camfield during the Daleks Masterplan. He serves as a Spaniard & Fight Arranger on the Smugglers, which is also Terry Walsh's Who début as a Militiaman, before Fight Arranging episode 3 of the Underwater Menace. For probably your clearest view of him see the first three episodes of Inferno where he's Private Wyatt. He founded the Havoc group of stuntmen, used regularly by Doctor Who in the early 70s until the point where Terry Walsh took over as regular stuntman for the Doctor doubling for first Jon Pertwee and then Tom Baker. There's some excellent location work in this episode involving the battle scenes in Covent Garden, filmed in and around the real world location . It's really odd seeing the Yeti above the surface wandering the streets of London after our only glimpses of them for years was in the tube tunnels. There's some lovely behind the scenes shots from this location shoot in the recently released Daily Mirror - The Doctors Archive which is well worth a look for many older and previously unseen photos. More of the story would have been filmed on location, but famously Douglas Camfield was denied permission to film on the Underground. However we'd already seen filming involving London Underground locations in a previous Doctor Who story. In the first episode Dalek Invasion of Earth the river bridge, under which a roboman throws himself to death on location which is then recreated in studio, was Kew Railway Bridge which carries the District Line over the Thames between Kew and Gunnersbury. Later that same episode there's location filming of Barbara & Susan crossing a deserted London including some filmed at the abandoned Wood Lane Central Line station. 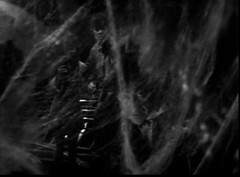 In Web of Fear the Army's fortress is the Deep Level Shelter at Goodge Street. Another Deep Level Shelter, at Camden Town, provides a location in The Sunmakers. Incredibly the country railway station seen in Black Orchid was at one time a London Underground station! Quainton Road Station was once served by Metropolitan line trains. The Met terminates now at Amersham, but once upon a time continued north, through Aylesbury to Quainton after which it branched to either Verney Junction or Brill, which is in Oxfordshire! 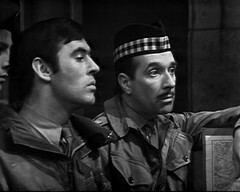 This episode was shown on 24th February 1968. The Web of Fear DVD was released on 24th February 2014, the 46th anniversary of the broadcast of this episode.